U.S. Coast Guard officials are reporting that a man died when he fell aboard a cruise ship that was traveling between Florida and the Bahamas. The 1,680-passenger cruise ship, Bahamas Paradise Cruise Line’s Grand Classica, had left the Port of Palm Beach and was heading to Freeport in the Bahamas. About 13 miles east of the port, the Coast Guard crews met the ship and brought the injured man back to shore. The man was taken to a hospital in Florida where he was pronounced dead. The ship then continued on to the Grand Bahama Island. International Maritime Organization rules will apply. Cruise ships are required to abide by these rules. So, when an accident occurs, the safety management system will include a reporting section and accident investigation that will dictate what all employees on the crew ship must do when the accident is reported. One of the steps they will take is to ensure that your accident is fully documented. Assumption of risk forms. There are plenty of activities that take place on a cruise ship. These may include rock climbing, ziplines, water slides, and much more. Before passengers are allowed to participate in these activities they are typically required to sign an assumption of risk form. 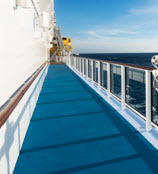 It is important for you to know that under maritime laws, a cruise ship cannot contract their way out of any responsibilities for negligence that results in injuries to their passengers. Be cautious what you say. When your accident occurs, an investigation will be conducted by the employees of the cruise ship and medical staff will generate a report. Anything you say to any of the employees or the medical staff will be documented. Because you may not be feeling well, you may leave out details. Therefore, be very careful of what you say. Be cautious what you put in writing. Most cruise lines will try to get you to write down the details of the accident in your own handwriting. However, you do not have to do this. If you are not feeling well enough to write one, don’t feel obligated to. Also, be careful allowing a family member to make a statement on your behalf because it may not be entirely accurate. Be aware. You must keep in mind that the employees are performing the investigation not just in accordance with their requirements, but also in anticipation of a lawsuit. This means that the pictures, statements, and other documentation they gather may be used in the event they are sued. Don’t mistake their questioning as care for you. They are trying to find out any statements that could protect them in a lawsuit. Be an investigator yourself. If you are able to, be your own investigator. If there were other passengers that witnessed the accident, try to get their names and contact information. Gather the names and job positions of any staff members that might have knowledge about your accident. Take pictures of the area where the accident took place, and document what you were wearing at the time of the accident. Even the smallest of details could be more helpful than you realize if your case goes to court. If you or a loved one has been injured in a cruise ship accident, it is important that you contact a personal injury attorney as quickly as possible. The Florida attorneys at the Leifer Law Firm will review your situation and determine what your best options are. Contact us today to schedule a free and confidential consultation.